In this video, Dr. Jeremy Brook, Dr. Mike Isseks, and Dr. Kristyn Silver, demonstrate how to perform The Ball Chair Spinal Lubrication Sequence. 2. Do all of the movements with superb posture. 3. Don’t go to your maximum. Leave some room to play. By shifting the nomenclature from spinal cord injury to brainal cord damage you will develop more respect and reverence for the central nerve channel. Dr. Brook suggests approaching your spinal cord as if it is an extension…an elongation….a tail of your brain. With that awareness you will care for your spine in the same manner as you would your head protecting your brain. Make decreasing brainal cord damage a part of your daily practice to reduce pain, increase your mobility, become more energized, and experience life at your maximum potential! 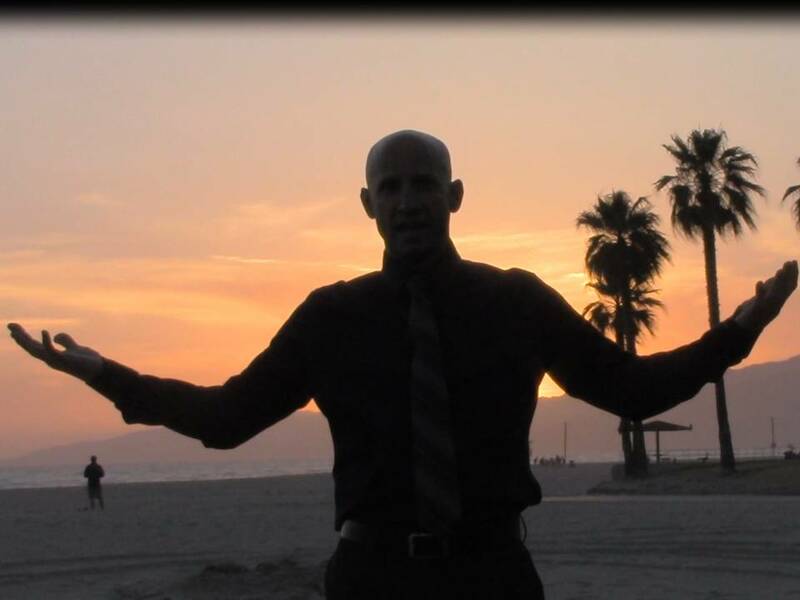 Filmed on Venice Beach, CA. 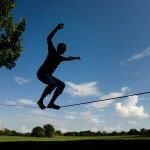 Slacklining is a fantastic sport that integrates core strength and balance coupled with laser sharp concentration. Slacklining benefits you on a primal level. It requires holistic attention from your body and mind.It challenges your neuro-musculo-skeletal system like no other exercise out there! If you aren’t connecting to your breath, feet, and core…prepare to meet the floor. Have fun and be safe! So how do you begin? First, go barefoot. Then, when you’re first on the line, lean back slightly so that as soon as you step forward, you don’t commit until you fully shift your weight onto the ball of your lead foot. Look to a fixed point at the end of the line, keeping your upper body still and your knees bent. Lead with the hips, not the shoulders. One of the coolest slacklining benefits occurs when you stand up on one foot. Balancing on your foot becomes the focus. This concentration requires you to find the perfect weight distribution for that moment in time. The leg becomes a lightning rod. From the connection to the slackline you root and rebound upward. Another slacklining benefit is connecting lines of energy. It sounds like an abstract concept but when you connect to different points and centers in the body you learn how to stand tall, fully connected to your core. In 2010, the International Journal of Sports Medicine published a paper (Granacher et. al, 2010) investigating the effect of slackline training for balance and strength promotion. While the study found no direct evidence that slacklining made strength training more effective, it did find that slacklining increased the rate of development of a muscular contraction. In other words, the given strength tasks were able to be performed faster by participants involved in slackline training. A study published in 2011 (Hüfner et. al, 2011) found that slacklining led to an increase in the structural and functional plasticity of the hippocampus, an area of the brain responsible for navigation and memory. While nobody pretends to understand the exact workings of the human brain, this study is backed up by numerous others that show that exercise and complex movement is good for the brain and helps with learning. The final study that we will discuss here was conducted in Switzerland (Keller, 2011) and found that participants in slackline training improved communication between sensors and the spinal cord, resulting in better postural control. This may come as a surprise to some, who may have seen many a slackliner with a hunched back and terrible posture, but keep in mind that most slackliners today were originally (and probably still consider themselves primarily) climbers, a group notorious for over-development of certain muscles and ignorance of others, resulting in terrible posture. https://thelifecenterchiropractic.com/wp-content/uploads/2017/07/TLC-web-header-logo-1.png 0 0 Jeremy https://thelifecenterchiropractic.com/wp-content/uploads/2017/07/TLC-web-header-logo-1.png Jeremy2014-05-10 05:55:282014-06-29 16:56:17SLACKLINING BENEFITS !!! GETTING IMPACT READY FOR LIFE! In this video Dr. Jeremy Brook, a Los Angeles holistic chiropractor, shares a video about one of the CELEBRATED benefits of chiropractic…. And that’s helping you become IMPACT READY for LIFE!! If you are not impact ready …what’s going to happen to you? Are you going to be able to ABSORB impacts and forces easily and efficiently? Watch this video to see how CHIROPRACTIC ADJUSTMENTS help you decrease tension and unnecessary bracing and flinching so you become IMPACT READY FOR LIFE!!! The end result is you’re going to be stronger, more flexible, happy, healthier, and have more energy. https://thelifecenterchiropractic.com/wp-content/uploads/2017/07/TLC-web-header-logo-1.png 0 0 Jeremy https://thelifecenterchiropractic.com/wp-content/uploads/2017/07/TLC-web-header-logo-1.png Jeremy2014-04-01 06:27:372014-09-09 01:18:29GETTING IMPACT READY FOR LIFE! Dr. Jeremy Brook, a Los Angeles Chiropractor, (www.spinechecker.com), teaches his patients how to develop exceptional posture using principles of gravity, anatomy and the physics of alignment. 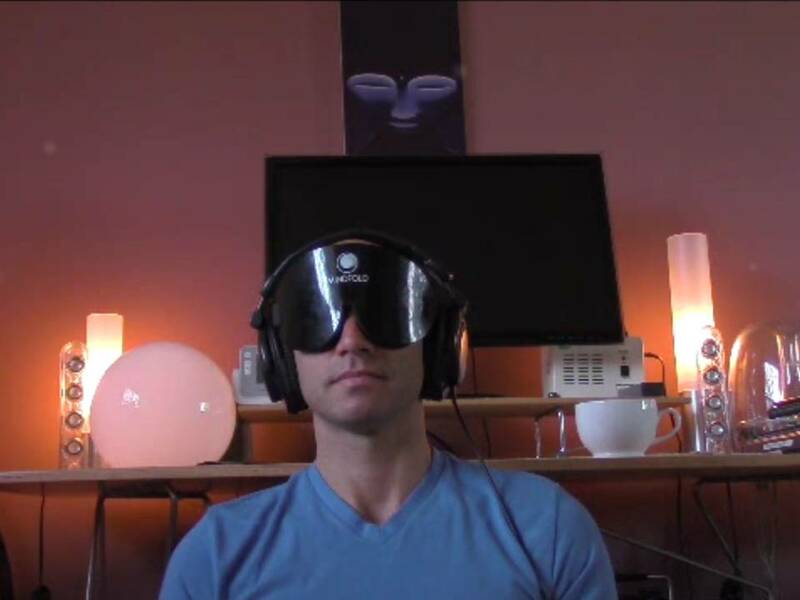 After watching all 6 parts you should be able to align your body and mind effectively to minimize stress/ strain/ dis-stress…leading to optimal performance and vibrancy. KNOW YOUR RANGE TO MINIMIZE PAIN AND MAXIMIZE VIBRANCY! Dr. Jeremy Brook shares a video about how to find your range within your body. In this video he uses examples of how far you can shoot a basketball, or how far your arrow can fly, or what is your punching and kicking range and how those ranges pertain to your health. By listening to your body’s signals you can minimize tension, stress, and distress… and increase your performance and vibrancy. Dr. Jeremy Brook is a chiropractor who sees patients different parts of Los Angeles including Venice, Santa Monica, West Los Angeles, Brentwood, and Mar Vista. https://thelifecenterchiropractic.com/wp-content/uploads/2017/07/TLC-web-header-logo-1.png 0 0 Jeremy https://thelifecenterchiropractic.com/wp-content/uploads/2017/07/TLC-web-header-logo-1.png Jeremy2014-01-20 01:58:332014-09-09 01:15:33KNOW YOUR RANGE TO MINIMIZE PAIN AND MAXIMIZE VIBRANCY!